Nubia Z11 review: An edge-to-edge screen sensation? As an all round package, there’s very little wrong with the Nubia Z11. If it didn’t have some quirky software issues, it’d be very easy to recommend. Likewise, if the OnePlus 3 wasn’t on the market at £45 cheaper, it would be an impulse buy. There has been a trend over the past few years: to release smartphones with high-end features at prices which make Samsung's eyes water. Some Chinese companies in particular even launch new phones under new sub-brands. For Huawei, that's Honor. For ZTE, that's Nubia. The latest Nubia phone, the Z11, has some fantastic specifications and an eye-catching bezel-free screen. But is it worth hunting down and spending your own hard-earned cash on? As far as design goes, there's one element that'll catch your eye and force you to take a step back: the edge-to-edge screen on the front. Unlike many other devices claiming to offer a screen without borders, the Z11's one gets mighty close to being a true edge-to-edge display. There's no bezel on either side, just the metal frame on the edges. Because of the slightly curved glass towards the edges, you can barely see the black screen gap, but if you look closely it's still there. It's so slim, you'll more than likely not notice it, at least not from an arm's length. Because of this, the Z11 is noticeably narrower than either the OnePlus 3 and Huawei P9 Plus, despite having the same 5.5-inch display size. In our view that makes it slightly more comfortable to hold in one hand than either of those. 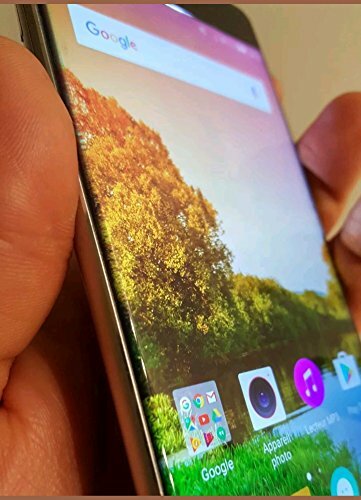 Rather than go with a full metal case for the back, with antenna bands, Nubia has opted for a metal panel with plastic caps on the top and the bottom. Because of that, it doesn't look or feel quite as well made as the solid body metal phones currently available. As with so many phones these days, the metal edges are slightly rounded, bead-blasted for a soft finish and polished with angled chamfers to add a reflective border. The Z11's bottom edge is home to a USB Type-C port and two sets of machined holes, only one of which covers a speaker, the other covers the mic. There's a 3.5mm jack on the top edge, along with an infrared blaster and noise-cancellation mic. To add at least a hint of individuality to the front panel, the capacitive home button is marked by a simple red ring which lights up when pressed. Likewise, the two capacitive option buttons are invisible until touched, when they're indicated by single red LEDs. It reminds us slightly of the original LG Chocolate, from years ago. While the Nubia Z11's design is certainly eye-catching, the display panel itself is one of adequate quality for a high-end phone. Quad HD resolution display would be nice, but the 5.5-inch 1080p IPS LCD panel on the front is plenty sharp enough. ATo begin with, the default colour temperature is a little warm/pink, but there are settings which allow you to adjust colour temperature and saturation to suit your preference. With a little jigging, the display soon met our preferred, slightly cooler and more vivid preferences. The one issue we found with the display was all down to the bezel-less design: because the glass on the edges is slightly curved, the content at the very edges appears to distort and change colour. It's largely unnoticeable - and is certainly among the most nit-picky of observations. For the most part, the Nubia Z11 flows and speeds through pretty much every task. Loading apps, playing games and browsing the web are all a breeze, thanks to the premium Snapdragon 820 processor inside. There's 4GB RAM paired with Qualcomm's high-end quad-core processor and a generous 64GB storage to ensure there's plenty of power and memory available. For those who need more storage for media, there's a microSD card expansion slot built into the dual-SIM tray. This, of course, can be used to host a secondary SIM card instead, if preferable. Apart from the odd time when the screen stutters during fast-scrolling on a Twitter feed or web page, the Z11 is smooth and fluid. Indeed, it acts like a flagship phone in that regard. The touchscreen is responsive - sometimes too much so at the edges - as is the fingerprint sensor on the back. Hold it too long, and it launches the super screenshot feature, which we'll come to detail later in the software section. Playing games is a joy, too, with the Z11 loading titles as quickly as we've seen on other devices, and showing on-screen animations without any of the stutter problems we've seen with many phones in the past. Depending on how much you use your device, you'll get anywhere between one and two full days of usage from the 3,000mAh non-removable battery. In our testing, we reached the end of a full day with anywhere between 30-45 percent of the capacity remaining. On the off-chance that you're a very heavy user, and can't make it last a whole day, the Nubia Z11 features Quick Charge 3.0 support, so you can top it up very quickly. Rather than just load the Z11 with the regular Android 6.0 Marshmallow operating system, Nubia has used its own custom software skin called Nubia UI. It's the fourth iteration of the company's software and comes with a boatload of interesting features, some which work better than others. Perhaps the most standout is the set of gestures designed to take advantage of the bezel-free display. These are five Edge Gesture functions, which come with their own individual gesture refrence. The first gesture involves holding the edge, then swiping inwards. This quickly gives you access to any desktop screen. It's particularly useful if you have multiple screens full of apps, folders and widgets, especially since there is no app drawer. Second is swipe up or down along one edge, which can be programmed to either switch to the most recent background apps with a neat page-curling animation, or to launch a specific app. Similarly, there's another which can clear your background apps from memory by repeatedly swiping up and down along one edge. Likewise, the double-edge swipe to increase/decrease brightness is easy to get wrong, and often leads to one of the other gestures being picked up instead. There's also the usual selection of touchscreen gestures, like double-tapping to wake the phone, resting a palm over the display to lock it, taking a screenshot by swiping up with three fingers and swiping across with three digits to switch apps. You can flip the phone over to pause music or mute a call, or shake the phone to clear notifications or background apps. But that's only the beginning of what this phone has in its software kitty. Dragging up from the bottom of the screen launches the split-screen mode for running two apps on the same screen. You can even activate something called "Dual instance" which allows two identical app icons on the home screen. Why? Simply to give you easy access to two different accounts. As well as all this, there's the Super Screenshot which offers more than just taking a simple full screenshot. You can take a "free screenshot" which lets you capture a portion of the screen inside a set shaped window, or draw your own shape. You can take a long screenshot, which is particularly useful if you want to capture an entire web page that extends beyond the bottom edge of the screen. Or, you can record a video of your screen as you use the phone. All in all, the Z11 has all the screen-shooting options you could wish for. While the feature list is certainly impressive, the software is far from perfect. It's littered with weird behaviours. Take, for instance, the Notification Centre which (by default) doesn't allow some third-party apps to show notifications on the lock screen, and doesn't show icons in the status bar. What that means is we often heard notifications come through, but had no idea where they were from. To fix this issue (or feature) you have to head to Settings > Notification Centre and then manually choose which apps you want to allow to send notifications. Another weird and frustrating feature was when we tried to install a custom launcher (Google Now launcher) no apps appeared in the app drawer. So, although the apps were installed, Nubia's software somehow made them invisible unless you were using the company's own pre-installed home screen launcher. When it comes to the camera, it's not necessarily the 16-megapixel sensor, or 4K video capture we find most appealing. We've seen those before, many times. Rather, it's the built-in optical image stabilisation (OIS) and other stabilisation features. Nubia speaks about "Hand-Held Electronic Aperture" and HIS "Hand-held image stabilisation", and claims that these are so good you'll be able to shoot long exposure shots without a tripod. That means you can take sharp, on-point panoramas as well as misty river or waterfall shots, just holding the phone in your hands. Like many phone cameras, the Z11 can struggle to autofocus on objects that are really close. Even in good lighting conditions. As far as features go, there's no shortage of shooting options available on the Z11. There are a number of long exposure presets available, like the light painting and star tracking modes, as well as the usual "Pro" mode which allows you to manually change white balance, ISO, focal length and shutter speed. In regular photo mode, by default, when you tap to focus on the screen, it immediately takes a picture. No separate tap of the shutter button required. This can be both convenient and frustrating. If it manages to lock on to where you want it to focus - which it does unless you're too close to an object - this feature is a great time saver. Sometimes, it doesn't focus, and you're left with a blurred picture you didn't want. Thankfully, you can switch it off by heading in to the camera settings options. Here, you can also activate HDR, switch on the grid and gradient meter, as well as switching on the grid, shutter sounds and face detection. End results are fine enough. Often images are a little washed out or lacking in contrast, but if you shoot in manual mode with the macro zoom setting, it can create a very pleasing background blur. As an all round package the Nubia Z11's flagship-spec innards, edge-to-edge display and generally smooth operation help it to stand out from the pack. However, it does have some quirky software issues. And let's not forget the OnePlus 3 which, at £45 cheaper, will be the more obvious and available choice for many. For a brand most of Europe isn't familiar with yet the Nubia Z11 does make a strong first impression though. That edge-to-edge screen is its obvious big sell and the hardware is decent. The main downside is less to do with the phone itself and more about just how competitive this mid-price market has become.